On October 12th, 2015 the Plurinational State of Bolivia (‘Bolivia’) became the 124th party to submit an INDC document to the UNFCCC (Plurinational State of Bolivia 2015). Although this document did not give an overall emissions goal, it did outline two types of contributions it would make to global efforts to address climate change via the UNFCCC process. The first contribution is linked to structural solutions to climate change, which for Bolivia entails the inward pursuit and outward promotion of “a new model of civilization” based not on consumerist cultures and capitalist structures, but rather on the concept of vivir bien (‘living well’, in harmony with Mother Nature) (1). The second contribution Bolivia presents is a series of national mitigation and adaptation actions, albeit with a notable emphasis on the latter, in the areas of water, energy, and forestry and agricultural policy. Amongst the numerous goals outlined in these three areas, those most clearly aligned with climate mitigation are a pledge to increased ‘participation’ of renewable energy in Bolivia from 39% (2010 level) to 79% by 2030, and a commitment to eradicate illegal deforestation by 2020 and increase the surface of forested and reforested areas by 4.5 million hectares by 2030. For each stated goal, Bolivia also offers a more ambitious, secondary target that is contingent upon international cooperation and grant-based financing and technology transfer; for example, a target of 81% renewable energy versus 79%. Bolivia has been quite explicit in calling for a maximum global temperature increase of 1.5 degrees (650 GtCO2) by 2050; however, the 2015 INDC submission does not quantitatively link Bolivia’s commitments and stated level of ambition to the achievement of this goal. Instead, it simply states that Bolivia’s nationally determined contributions are “ambitious and just” given their national circumstances (6). Although Bolivia has developed a methodology to determine the ‘fair share’ of atmospheric space between countries (see below discussion of the Climate Justice Index), they do not expand in the INDC or elsewhere upon what their particular ‘fair share’ of the carbon budget would be according to this methodology, and whether and how their stated commitments would ensure that they remain within their allotment. However, Bolivia’s INDC is unique in that it does not only focus on quantitative goals relating to greenhouse gas emission reductions, but also proposes a more qualitative contribution in the form of a commitment to encourage and pursue changes in the global capitalist structure, which according to Bolivia has “triggered the climate crisis” and is “leading humanity towards a horizon of destruction that sentences nature and life itself to death” (1-2). Given Bolivia’s assertion that a lasting solution to the climate crisis cannot be achieved without the destruction of capitalism, this contribution of encouraging structural change is arguably more important than any quantitative emission reduction target Bolivia could offer. This marks an interesting rhetorical shift from previous Bolivian communications with the UNFCCC, as Bolivia is now framing their ideological opposition to capitalism as part of their contribution to the UNFCCC process, rather than an ethical ground on which to oppose it. Thus, if one takes a very broad interpretation of the concept of ‘common but differentiated responsibilities’, Bolivia’s perceived responsibility to encourage a move beyond a “simplistic approach to decarbonization of the economy” (6) towards a more systemic transition may be interpreted not only as consistent with, but essential to, the achievement of a 1.5 degree warming limit which they call for. Bolivia’s position on what ethics, justice and equity require of it is made explicit throughout their INDC submission. Although Bolivia does not commit to a particular GHG emission reduction target, they do acknowledge the need to “make fair and ambitious efforts to address the impacts of climate change”, even though they have “not caused the phenomenon of global warming” (5). Here, Bolivia carefully avoids referring to their contributions in terms of an ethical ‘responsibility’, while making clear their intent to prioritize addressing the impacts of climate change (through economic growth aimed at facilitating adaptation and resilience), with mitigating the source of the problem (GHG emission levels) as a secondary objective. Although subtle, this phrasing lays the groundwork for the ethical basis of the Bolivian INDC, which justifies Bolivia’s commitments explicitly in terms of climate justice, climate debt, and historical responsibility for climate change. Bolivia has always been emphatic that an, “equitable sharing of atmospheric space is an inalienable and fundamental right of all nations and people” and that developing countries whose contributions to global atmospheric GHG levels have been minute should therefore be given ‘atmospheric space’ to pursue the overriding priorities of economic and social development (Plurinational State of Bolivia, 2010). In calling for deep emission cuts by developed countries, Bolivia argues that “the scale and timing of emission reductions by Annex I countries must be sufficient to ensure that developed countries’ historical debt for their excessive past consumption of environmental space, and their continuing excessive per-capita emissions, is fully repaid to developing countries” (Ibid). Bolivia further develops this ethical position into a formal methodology for calculating what the global fair share of remaining atmospheric space should be in its INDC submission. This ‘Climate Justice Index’ calculates each country’s ‘fair share’ of atmospheric space according to their; 1) historical responsibility since 1750; 2) ecological footprint; 3) development capacity; and 4) technological capacity. According to this methodology, Bolivia asserts that non-Annex I (developing) countries should have 89% of the remaining atmospheric budget, leaving Annex I (developed) countries with just 11%. However, Bolivia does not go into details about how the 89% of atmospheric space reserved for non-Annex I countries should be divided, nor what types of commitments each country would be responsible for given their positioning on the index. 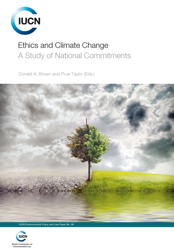 They instead reiterate an ethics of responsibility for developed countries both to substantially reduce their own emissions as well as provide funds for both adaptation and mitigation activities within developing countries whose overriding priorities remain the pursuit of economic growth and domestic sustainable development. Bolivia has long argued that it is the responsibility of those developed countries historically responsible for climate change to “support and rehabilitate developing countries in addressing climate impacts” given that those who have contributed the least, and who have the least capacity, will be the most affected by climate change (Plurinational State of Bolivia, 2012, 4). Given that Bolivia sees themselves as amongst the victims, rather than the perpetrators, of the climate crisis, their primary emphasis in the INDC is therefore on the ethical responsibility that other countries (primarily developed countries) have towards Bolivia and all other poor, vulnerable countries with low historical contributions to aggregate global GHG concentrations. Thus, although Bolivia acknowledges that they must make ‘fair and ambitious efforts’ to address the impacts of climate change, their INDC contributions clearly prioritize those actions that can contribute to adaptation and climate resilience in a context of continued economic growth and development. This is consistent with previous Bolivian submissions to the UNFCCC, wherein Bolivia has demanded that developed countries dedicate 3% of their GDP towards paying their ‘adaptation debt’ to developing countries, in addition to supporting the creation of a multilateral Loss and Damage Mechanism to further compensate developing countries for the present and future damages that are the, “unfortunate result of developed country Parties’ insufficient ambition” in addressing their historical accumulation of greenhouse gases and achieving the objectives of the UNFCCC (Plurinational State of Bolivia, 2010; Plurinational State of Bolivia et al., 2012, 6-8). Thus, in determining its own national commitments and evaluating those of others, Bolivia clearly supports the concept that developed countries have an ethical obligation to aid and compensate those countries and populations most vulnerable to the adverse effects of climate change. However, Bolivia is perhaps unique in that they do not limit themselves to such anthropocentric ethical considerations, but rather expand this ethical obligation towards non-human life and the natural world, embodied by the concept of Mother Earth. Bolivia therefore also frames both their commitments (and their expectations of others’) in part upon what they believe is required to protect the integrity of Mother Earth and its ability to regenerate and adapt naturally to climate change (1-2; see also, Plurinational State of Bolivia, 2012). The Bolivian state also uses the INDC submission as a platform to reiterate calls for the creation of an international judicial system that “punishes countries that do not fulfill [their] international commitments to protect the integrity of Mother Earth” (2-3), thus demonstrating the Bolivian belief (and legal precedent) that the natural world, referred to as Mother Earth, has legal rights and intrinsic values apart from those which human beings (or worse, economic markets) determine to be the case. A full analysis of the legal and ethical implications of this notion of assigning legal personhood and rights to nature is beyond the scope of this report. However, one clear implication this approach has for the Bolivian INDC is that is provides a clear ethical basis for Bolivia’s long-standing opposition to market-based solutions to the climate crisis, most notable with respect to the proposed Reducing Emissions from Avoided Deforestation and Forest Degradation (REDD) mechanism. Bolivia has “consistently questioned the linking of forests to global carbon markets for ethical reasons as this authorizes the effective conversion of Mother Earth, considered sacred by Bolivian society, into a commercial commodity” (Plurinational State of Bolivia, 2014, 4). Although Bolivia is not alone in its opposition to a market-based REDD mechanism, it is perhaps unique in its framing the concept of carbon offset markets like REDD as not merely inefficient or inequitable, but also as an ethical and legal affront to the sacred role of nature in Bolivian society and its status under Bolivian law. Given that the Bolivian INDC was submitted to the UNFCCC shorty before the time this report was written, there has not yet been significant analysis of either its technical or ethical content from actors within Bolivia. However, the Bolivian INDC draws its ethical principles explicitly upon the outcomes of the People’s Summit in 2010 and the People’s Conference in 2015, including but not limited to the People’s rejection of the “vision of empires and transnational corporations” in favour of the pursuit of an “alternative solution to the climate crisis” (1). This suggests that civil society has played an important role in shaping the overall ethical-ideological approach upon which the Bolivian INDC is based, even if they have not directly participated in decisions about what concrete actions were to be included or undertaken any evaluation of whether and how these actions effectively fulfil the aforementioned ethical mandate. However, given the increasing scepticism about the will and ability of the Bolivian Government to implement domestic environmental policies that adhere to the ethical principles they so vocally support at the international level (see answer to Question #10), substantive ethical and technical analyses of the content of the INDC are perhaps inevitable as the COP21 in Paris approaches. Media coverage of Bolivian climate policy in the lead-up to COP21 has largely focused on two major political developments, both of which are relevant for, but not directly related to, the commitments made in the INDC. The first is the colourful proclamations made by the Bolivian government at the World People’s Conference on Climate Change and the Defense of Life, held in Tiquipaya in the Bolivian state of Cochabamba, just days before Bolivia submitted their INDC. The outcomes of this conference, which build directly upon those of the 2010 World People’s Conference on Climate Change and the Rights of Mother Earth (also held in Tiquipaya), have widely been credited as the source of Bolivia’s ethical mandate with respect to climate policy since the controversial COP15 in Copenhagen. The INDC submission reiterates these close linkages by explicitly attributing its ethical approach to the “vision of the peoples and social organizations” as represented by the outcomes of the Peoples’ Conferences (1). Although in a way analysis of the ethical statements made at the Peoples’ Conference is akin to analysis of the ethical basis of the INDC, there has yet to be any significant media coverage or analysis of whether and how the technical details of Bolivia’s INDC commitments successfully fulfil these ethical principles. The second focus of the Bolivian media has been on recent decision by the Bolivian Government to approve oil exploration in protected areas, in clear violation of legal and normative precedents concerning indigenous rights as well as the rights of Mother Earth (see answer to Question #10). This controversial move has intensified long-standing critiques about Morales’ resolve in terms of putting into practice what he so voraciously defends in speech, and will undoubtedly sharpen the focus of both civil society actors and the media concerning the content and consistency of Bolivia’s ethical assertions in climate and environmental policies moving forward. Thus, although it has not yet been the case, it is reasonable to expect that more pointed analyses and heightened media coverage of the ethical features of Bolivia’s INDC submission will be forthcoming. In the opening paragraph of its INDC submission, Bolivia highlights that any contributions it proposes only apply under “strict compliance” with Article 4.7 of the UNFCCC, which states that “…economic and social development and poverty eradication are the first and overriding priorities of the developing country parties” and that any actions taken by developing countries will depend upon the commitments of developed countries to transfer financing and technology to assist with climate action. Accordingly, Bolivia clearly states that its overriding goal of poverty reduction will “not be possible if there are no actions to fully develop the national economy and to reduce the impacts of climate change” (4), thus suggesting a prioritization of economic growth and development in conjunction with activities contributing primarily to adaptation and climate resilience. This position can also be seen in Bolivia’s calculated conclusion that a fair and equitable sharing of the global carbon emissions budget would assign 89% of the remaining atmospheric space to developing nations to allow them room to develop, while requiring developed countries take deep emissions cuts to ensure they remain within the remaining 11% allotted to them. Bolivia does not explicitly explain what its particular share of this 89% would be, or whether and how its stated contributions will ensure that it remains within its ‘fair’ allocation; however, as Bolivian ex-ambassador to the United Nations Pablo Solón has explained; “It’s not possible that only 20 percent of the world occupies 80 percent of the atmosphere with their emissions, because then what happens with the rest of the world is that we don’t have any space for any kind of development, because you need to industrialize, and that’s going to mean you are going to throw some greenhouse gas emissions into the atmosphere” (quoted in Aguirre and Cooper 2010, 242). For Bolivia then, climate justice means that their contributions to addressing the impacts of the climate crisis must necessarily take place in a context of expanding productive capacity of key sectors within Bolivia, including agriculture, oil and gas (5-6). Bolivia is therefore quite explicit about what climate justice demands of the Bolivian state (adaptation measures and pursuit of structural changes) and also what it allows (expansion of extractive industries in the pursuit of economic growth and development). However, the Bolivian government does not, in the INDC or elsewhere, explain whether and how these two ethical imperatives are compatible in the Bolivian context. They also do they disclose the full range of interests (both private and state) being served by the continued promotion of extractivist activities, instead claiming that all is for the public good and developmental needs of the Bolivian people. There are a number of legal and normative mechanisms within Bolivia that theoretically facilitate the participation of Bolivian society in environmental decision-making writ large. Since Evo Morales became the first Indigenous President of Bolivia in 2006, he has gone to great lengths to link norms of political inclusivity and procedural equality with the Bolivian conception of climate justice. Thus, Morales’ long ago promised to “govern by obeying the people” and to give social movements and other civil society actors an increased voice in policy decisions, including those relating to the environment (Aguirre and Cooper, 2010; Kohl, 2010). This stated imperative of political inclusivity is reflected in several Bolivian laws and institutions, including strong participatory provisions in the Bolivian Constitution, as well as the creation of a Bolivian Platform for Climate Change in 2009, which brought together representatives from large international NGOs and Bolivian rural social movements to debate and formulate Bolivian climate policy (Fabricant 2013). However, concrete evidence of the influence of social actors over Bolivia’s conceptualization of climate ethics seems to be fairly isolated to participation in the 2010 and 2015 People’s Conferences, the outcomes of which are widely thought to be the source from which the Bolivian government has drawn their ethical mandate for climate policy. Despite critiques of both of the inclusiveness of these various participatory processes (Aguirre and Cooper, 2010; Laing, 2012; Gustafson, 2013), the ethical position on climate change espoused by the Bolivian Government seems tightly aligned with that of most major societal actors (see Wright, 2012), implying that their ethical preferences were at some point taken into account. However, what of those who wish to challenge the ethical content of the Bolivian position? Bolivia is perhaps a unique case to analyze in this regard, as in their case notions of climate justice and ethics are not merely rhetorical tools to influence policy outcomes or lenses through which these policies can be evaluated; rather, they are at the very legal and ideological core of the Bolivian state. Thus, although there may be institutional mechanisms for interested actors to participate in climate policy formation, there are legal and normative conditions that seem to limit the extent to which this societal influence can take the form of an ethical critique. To give one example; although few within Bolivia question the government’s position on climate debt and equitable distribution of atmospheric space, what has not been as widely accepted is its voracious opposition to market-based mechanisms such as REDD on the basis that they are ethically inconsistent with the Bolivian notion of vivir bien. However, because the government has gone to such great lengths to frame carbon markets as antithetical to the constitutionally protected concept of vivir bien, the general sentiment amongst civil society actors is that, as one individual put it, “You can’t be pro-market without being anti-Bolivia” (personal communication, March 2015). Additionally, the government’s increasingly hostile response to ideological opposition undoubtedly deters would-be critics from challenging the government’s ethical position regardless of whether or not formal mechanisms exist through which they might do so (see Human Rights Watch 2015). Thus, although Bolivia rated fairly highly on the World Resource Institute’s Environmental Democracy Index in terms of ‘rights of the public concerned to challenge any decision, act or omission by public authorities that allegedly violates the procedural legal norms of the state relating to the environment’, this does not say anything about the ability of social actors to challenge the substantive ethical basis on which these legal norms are based, which for reasons described above seems to be fairly limited. As mentioned above, there seems to be a general consensus, not only among Bolivian actors but developing countries more generally, that the ethical responsibility for mitigating climate change rests primarily with developed countries. There is no evidence that any sub-state governments within Bolivia have taken a position contrary to this. 10. Has your national government taken any position on or otherwise encouraged individuals, businesses, organizations, subnational governments, or other entities that they have an ethical duty to reduce greenhouse gas emissins? The ethical position of the Bolivian government concerning responsibility for climate change focuses on the obligations of developed countries towards those must vulnerable to the adverse impacts of climate change, rather than any ethical obligation on the behalf of actors within Bolivia to reduce their GHG emissions. However, in the past Bolivia has recognized that the construction of a model of sustainable development in harmony and balance with Mother Earth will require promoting climate and environmental responsibility in public and private actors, including those within Bolivia (Plurinational State of Bolivia, 2012). Acknowledging that developing countries have little moral basis on which to critique developed countries if ‘they themselves decide to copy the ‘American model’’ (Orellana, 2013, author’s translation), Bolivia has gone to great lengths to promote, both domestically and internationally, the concept of buen vivir as an alternative to the capitalist system’s promotion of “consumerism, warmongering and commercialism” that causes the “destruction of Mother Earth and humanity” (1). Given Bolivia’s claim that, under capitalism, humanity lives “without values and without ethical principles” (3), their promotion of vivir bien as a path to a more sustainable and holistic state of development can be seen as an ethical mandate for Bolivian society as a whole to address the structural causes of the climate crisis, above and beyond (or perhaps aside from) the reduction of greenhouse gases as an explicit objective or obligation. Issues of climate justice and ethics are, at least rhetorically, at the core of Bolivian climate policy formation, and will remain so as long as developed countries continue to shirk their ethical obligations as defined by the Bolivian state. The Bolivian state has been one of the key international proponents of climate justice since it stood alone amongst countries in rejecting the Cancún climate agreement, and is likely to remain the primary champion of global climate justice moving forward (Akin, 2012). However, the challenge for Bolivia is not about how to formulate and articulate a clear ethical position at the international level; but rather how to ensure that these ethical principles are translated into effective and equitable climate policies at home. The Morales government has often been accused of inconsistency, and even hypocrisy, in its domestic application of the ethical principles it espouses internationally and which are engrained in the Bolivian Constitution (Aguirre and Cooper, 2010; Bond 2012; Laing, 2012; Slunge and von Walter, 2013). However, the recent decision of the Bolivian government to approve a series of decrees that will allow for oil exploration in protected areas and significantly weaken the ability of indigenous groups to influence hydrocarbon activities on their territories has called into serious question the commitment of the Bolivian state not only to addressing the climate crisis but also to some of its fundamental ethical claims relating to the rights of indigenous people and Mother Earth (Pashley 2015; but see also Andersen 2015). Thus, while an in-depth analysis of Bolivia’s intended contributions under the INDC is beyond the scope of this paper, and in any case premature given their stated contingency on the outcomes of COP21, these broader political developments in Bolivian environmental practice suggest the need for closer scrutiny by all actors of both authenticity in word and consistency in deed of the Bolivian variant of climate ethics moving forward. Aguirre, J.C. and Cooper, E.S. (2010) ‘Evo Morales, climate change, and the paradoxes of a social-movement presidency’, Latin American Perspectives, issue 173, vol 37, no 4, pp238-244. Akin, J. (2012) ‘Civil justice in the mountains: The Bolivian Andes as grounds for climate reform, Colorado Journal of International Environmental Law and Policy, vol 32, no 2, pp434-468. Andersen, L.E. (2015, July 2). Oil exploitation in protected areas – a contradiction in terms? [blog entry]. Institute for Advanced Development Studies. Retrieved from http://inesad.edu.bo/developmentroast/2015/07/oil-exploitation-in-protected-areas-a-contradiction-in-terms/, accessed 01 November 2015. Bond, P. (2012) Politics of Climate Justice: Paralysis above, movement below, University of KwaZulu-Natal Press, Scottsville, South Africa. ECSBCC 2015, ‘Prospuesta de la Sociedad Civil sobre el INDC de Bolivia’, retrieved from https://funsolon.files.wordpress.com/2015/09/propuesta-indc-escbcc.pdf, accessed 28 October 2015. Fabricant, N. (2013). ‘Good Living for Whom? Bolivia’s Climate Justice Movement and the Limitations of Indigenous Cosmovisions’, Latin American and Caribbean Ethnic Studies vol 8, no 2, pp159-178. Kohl, B. (2010) ‘Bolivia under Morales: A work in progress’, Latin American Perspectives, issue 172, vol 37, no 3, pp107-122. Laing, A.F. (2012) ‘Beyond the zeitgeist of ‘post-neoliberal’ theory in Latin America: The politics of anti-colonial struggle in Bolivia’, Antipode, vol 44, no 4, pp1051-1054. Orellana Halkyer, R. (2013) ‘Desarrollo con pobreza o la pobreza del desarrollo: Limites de la Madre Tierra, vulnerabilidad de las Metas del Milenio y del crecimiento’. Universidad de la Cordillera/Fundación de la Cordillera, La Paz, Bolivia. Pashley (2015, September 10), ‘Bolivia Dash for Oil Undermines Mother Earth Summit. Climate Change News’, retrieved from http://www.climatechangenews.com/2015/10/09/bolivia-dash-for-oil-undermines-mother-earth-summit/, accessed 28 October 2015. Plurinational State of Bolivia (2015), ‘Intended National Determined Contribution from the Plurinational State of Bolivia’, available at http://www4.unfccc.int/submissions/INDC/Published%20Documents/Bolivia/1/INDC-Bolivia-english.pdf, accessed 2015 October 25. Slunge, D. and von Walter, S. (2013) ‘Environment and Climate Change in Bolivia: Challenges and opportunities for development’, SIDA’s Helpdesk for Environment and Climate Change, University of Gothenburg and Swedish University for Agricultural Sciences. Wright, K. (2012). ‘Bolivian civil society COP18 statement’, World Development Movement, available at http://wdm.org.uk/climate-change/bolivian-civil-society-cop18-statement-doha, accessed 02 August 2014.